Humans need eight essential trace elements for good health, and one of them is selenium – a powerful antioxidant that is important for thyroid and brain function as well as metabolism. But trace elements can't be used by the body until they are integrated into a protein molecule. Selenium is unique because it is folded into its protein while the protein molecule is still being made. All other trace elements are added to their respective protein molecules after the cell has finished synthesizing the protein. Researchers at the University of Illinois at Chicago have discovered exactly how selenium is incorporated into selenoproteins. The finding is published in the journal Nature Communications. Proteins are made by linking amino acids together, one at a time, in a chain. Cellular structures called ribosomes serve as docking stations, where all the components involved in protein production come together — messenger RNA, which serves as the protein's blueprint; the amino acid building blocks, each attached to its own specific transfer RNA; and various helper molecules. Elongation factors are an important type of helper protein that guide the amino acids to the ribosome during protein synthesis. In humans, elongation factor eEF1A helps string together amino acids at the ribosome – that is, all amino acids except selenocysteine, the amino acid that holds selenium. 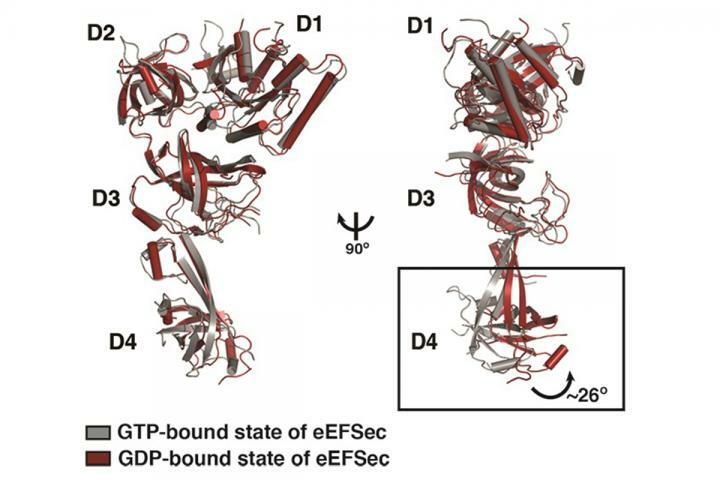 In humans, selenocysteine is incorporated into proteins with help of a unique elongation factor called eEFSec that works very differently from eEF1A. "We've known that selenium is special when it comes to protein synthesis, because there is a whole other set of rules and tools in use," says Miljan Simonovic, associate professor of biochemistry and molecular genetics in the UIC College of Medicine and corresponding author on the paper. "Not only does it have its own elongation factor, but selenocysteine is also very unusual because it is represented in the genetic code by the same three-letter key, or codon, that signals for protein synthesis to stop." Normally, as the ribosome reads the messenger RNA — or mRNA — and reaches this stop codon, it detaches from the mRNA because its work is done, although the full-length protein may still be modified through other processes. But sometimes the ribosome runs the stop sign and adds selenocysteine instead — and continues to elongate the protein until it reaches another stop sign. "When the stop codon means 'bring in a selenocysteine,' additional protein factors together with structural features in the mRNA around that stop codon, such as loops, indicate to the ribosome not to stop selenoprotein production," said Malgorzata Dobosz-Bartoszek, postdoctoral research associate in biological sciences, who is lead author on the paper. "The selenocysteine elongation factor, eEFSec, plays a key role in helping to recognize the stop codon as actually coding for selenocysteine." Simonovic said the eEFSec elongation factor also stands apart in how it changes shape when it delivers selenocysteine to the ribosome. The researchers showed that eEFSec bends about 20 degrees when delivering selenocysteine, while eEF1A bends "much more dramatically — more like 90 degrees" when it drops off the other amino acids. Simonovic thinks that the reason selenocysteine is handled so differently during protein synthesis traces back to the Great Oxygenation Event. This was the period about 2.3 billion years ago when free oxygen in Earth's atmosphere suddenly spiked, due to the evolutionary emergence of plants and photosynthesis as a way to derive energy from the sun. Organisms needed to evolve ways to prevent cellular damage caused by oxidation, and selenium, a powerful antioxidant, would have been available. But already-existing processes for incorporating trace elements into proteins may not have worked for selenium, which is extremely reactive. "We know that eEFSec has a unique domain that helps it safely interact with selenocysteine," Simonovic said. Co-authors on the Nature Communications paper are Mark Pinkerton and Paul Copeland of the Robert Wood Johnson Medical School; Zbyszek Otwinowski of the University of Texas Southwestern Medical Center; Srinivas Chakravarthy of the Illinois Institute of Technology; and Dieter Soll of Yale University. The research was supported by a UIC startup fund; grant 225752 from the American Cancer Society, Illinois Division; grants GM097042, GM070773, GM22854 and 1S10D018090-01 from the National Institute of General Medical Sciences; and grant 085P1000817 from the Michigan Economic Development Corporation and the Michigan Technology Tri-Corridor.